Skin is the body’s largest organ, and scientists at UCSF and the San Francisco Veterans Administration (VA) Health Care System think it may be to blame for body-wide inflammation linked to numerous chronic diseases of aging. 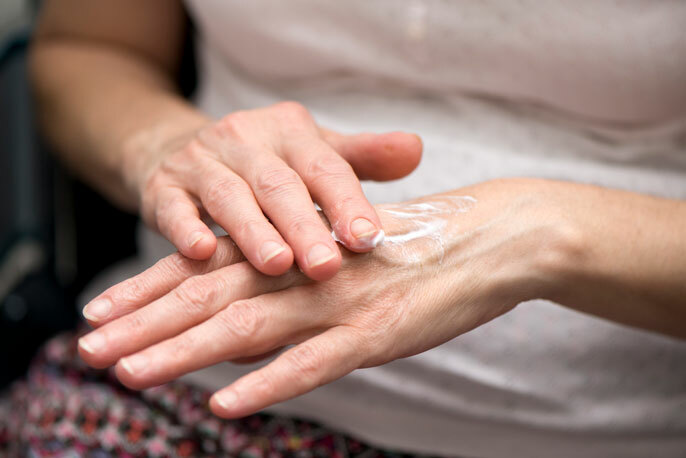 The good news is that properly caring for the skin with a moisturizing cream may lower inflammation levels and potentially reduce the risk of a number of age-related diseases, according to a new clinical pilot study. As humans get older, we experience a low-level of inflammation — dubbed “inflamm-aging” — driven by an increase in molecules in the blood called cytokines. This age-related inflammation has been linked to serious chronic diseases, including Alzheimer’s disease, cardiovascular disease, and diabetes. Scientists initially thought that the inflammation stemmed from the immune system or the liver, but a group of dermatologists at UCSF have a different theory. Our skin starts to deteriorate around age 50 with changes to epidermal pH, hydration, and the permeability barrier, which keeps water in and bacteria and other potential pathogens out. A loss of moisture and breaks in the permeability barrier cause the skin to release inflammatory cytokines. Ordinarily, these cytokines help to repair defects in the barrier, but in aging skin the barrier can’t be fixed as easily, so the inflammatory signals continue to be released, eventually reaching the blood. In the study, published March 5, 2019 in the Journal of the European Academy of Dermatology and Venereology, Mauro, Man and colleagues attempted to reverse age-related skin damage using an over-the-counter skin cream formulated based on prior research by Man and colleagues, and which the researchers had previously shown to contribute to skin repair based on its beneficial ratio of three types of lipids (cholesterol, free fatty acids, and ceramides) that are vital for skin health. Thirty-three older adults between the ages of 58 and 95 applied the cream all over their bodies twice a day for 30 days. After a month, the researchers measured blood levels of three cytokines — interleukin-1 beta, interleukin-6, and tumor necrosis factor (TNF) alpha — that have all been implicated in age-related inflammatory diseases. Using the cream reduced the amount of all three cytokines compared to both the participants’ levels before using the cream and the levels of similarly aged adults who did not use the cream. In fact, using the cream lowered participants’ cytokine levels to be nearly equivalent with people in their 30s, suggesting that rejuvenating the skin can reverse “inflamm-aging.” The cream also improved skin hydration, lowered pH, and repaired the permeability barrier. The scientists now plan to conduct a longer, larger study to test if lowering cytokine levels with the cream can delay or prevent age-related inflammatory diseases. Authors: The co-lead authors of the study were Li Ye of Southern Medical University in Guangzhou, China, and Erle Dang of Xijing Hospital in Xi’an, China. Additional authors on the paper include: Kenneth Feingold of UCSF/SFVAMC; Gang Wang and Chen Yu of Xijing Hospital in Xi’an, China; Lizhi Hu of Tianjin Medical University in Tianjin, China; Sekyoo Jeong of Seowon University in Cheongju, South Korea; and Chengzhi Lv of Dalian Skin Disease Hospital in Dalian, China. Funding: This work was supported by the National Institute on Aging (AG028492), the National Institute of Arthritis and Musculoskeletal and Skin Diseases (AR061106, AR051930), and the National Natural Science Foundation of China (81430037, 81573075). Conflicts: Elias and Man serve as consultants to South Korea–based Neopharm, Ltd., which produces the lipid-balanced moisturizer used in the study. An invention disclosure has been filed with the UCSF Office of Innovation Ventures for the concept of preventing/treating systemic disorders using strategies that improve epidermal function. UC San Francisco (UCSF) is a leading university dedicated to promoting health worldwide through advanced biomedical research, graduate-level education in the life sciences and health professions, and excellence in patient care. It includes top-ranked graduate schools of dentistry, medicine, nursing and pharmacy; a graduate division with nationally renowned programs in basic, biomedical, translational and population sciences; and a preeminent biomedical research enterprise. It also includes UCSF Health, which comprises three top-ranked hospitals — UCSF Medical Center and UCSF Benioff Children’s Hospitals in San Francisco and Oakland — as well as Langley Porter Psychiatric Hospital and Clinics, UCSF Benioff Children’s Physicians and the UCSF Faculty Practice. UCSF Health has affiliations with hospitals and health organizations throughout the Bay Area. UCSF faculty also provide all physician care at the public Zuckerberg San Francisco General Hospital and Trauma Center, and the SF VA Medical Center. The UCSF Fresno Medical Education Program is a major branch of the University of California, San Francisco’s School of Medicine. About SFVAHCS: The San Francisco VA Health Care System (SFVAHCS) is a comprehensive network that provides health services to Veterans through the San Francisco VA Medical Center (SFVAMC) and six community-based outpatient clinics in Santa Rosa, Eureka, Ukiah, Clearlake, San Bruno anddowntown San Francisco. SFVAHCS has a long history of conducting cutting-edge research, establishing innovative medical programs, and providing compassionate care to Veterans. SFVAMC has several National Centers of Excellence in the areas of epilepsy treatment, cardiac surgery, post-traumatic stress disorder, HIV, and renal dialysis. SFVAMC’s $79 million research program is one of the largest in the Veterans Health Administration. SFVAMC has been affiliated with the University of California, San Francisco (UCSF), School of Medicine for more than 50 years.